Silo with suspended cone failure. Due to material moisture and cold temperatures, the coal stored in the silo above experienced flow stoppage, which resulted in bridging (or ratholing) inside the storage area. As the material thawed or more material was added, hundreds or thousands of tons of coal fell to the suspended cone below. The suspended cone broke loose from the silo walls and fell straight down, destroying all the discharge equipment below and blowing out the silo wall. 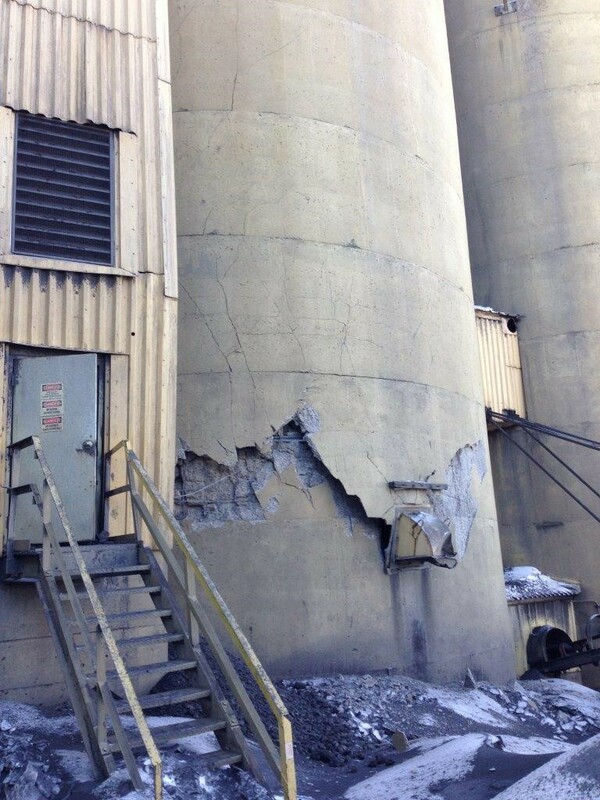 Due to the damages, this silo was deemed irreparable by professional engineers. To prevent further failure, the customer scheduled inspection of their other existing coal storage silos with the same construction design. 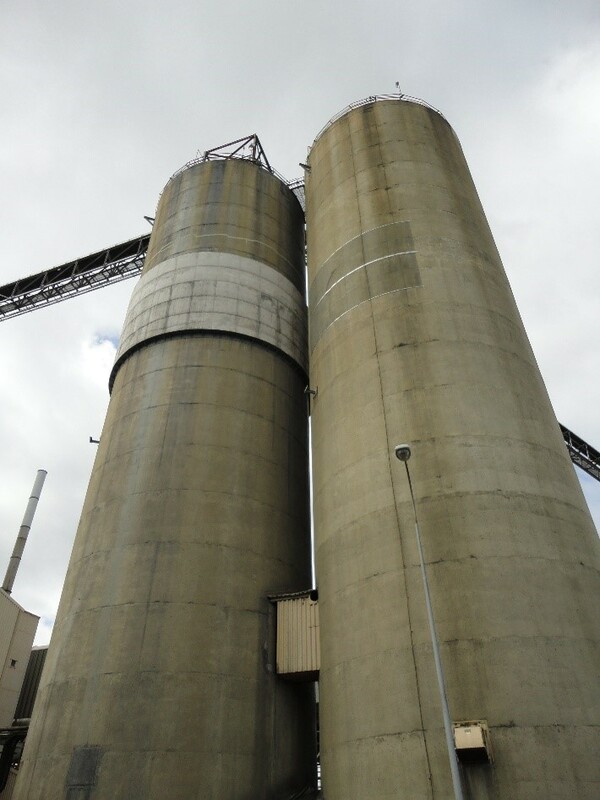 Silos with the same suspended cone design were inspected and repaired before failure could occur. Inspection of the two existing coal storage silos demonstrated that the cones were vulnerable to the same type of failure due to construction design with a suspended cone. To remedy this issue in the two remaining silos different, solutions were completed to accomplish the same objective - eliminate the suspended cone design and create a cone supported from underneath. The existing suspended cone design of the two silos consisted of steel cone plates welded to a steel plate ring girder that was embedded into the silo wall. To strengthen and repair this design on the silo pictured to the far right, a steel reinforced, concrete collar was poured inside the silo to support the hopper weight from underneath the cone. The cone on the silo pictured to the left was in worse condition and the exterior wall showed signs of potential failure. For this reason, an exterior collar wall was poured around the affected area where cracking was observed. Internally, concrete pilasters were poured from the foundation to support the new steel reinforced concrete collar that supports a new steel cone.